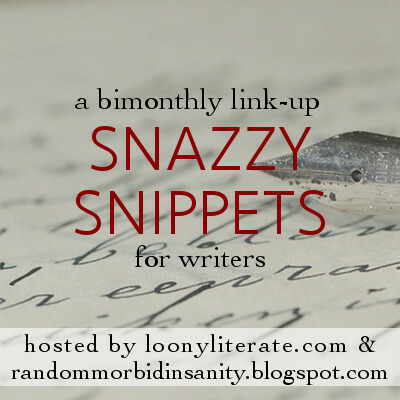 So in case you didn't hear last week, Snazzy Snippets co-hosted by myself and Emily @ Loony Literate is back! Snazzy Snippets is a chance for writers to share snapshots of their writing around certain themes. You can find out more and link up with us here! 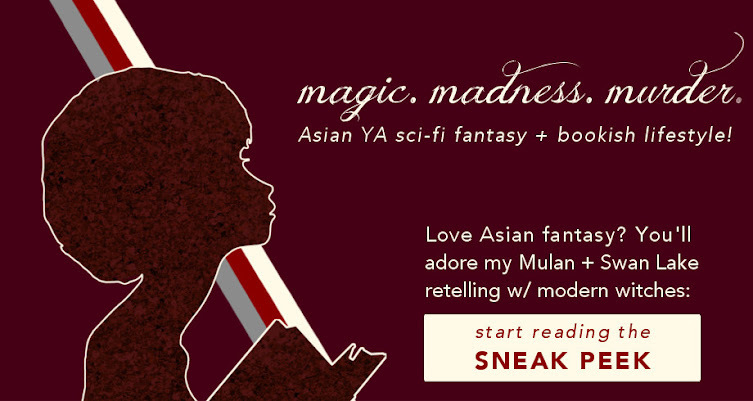 Today I'm sharing two snippets from my NaNo project Witches Black and Silver, and one from my other WIP Matryoshka. WARNING: the first two snippets were written in NaNo, and are appropriately rambling and absolute weirdness from typing too quickly. I hope they are at least entertaining. Oh, and another thing: because of school and such, I have not been replying or commenting back for the last couple posts. I'm barely finding enough time to complete my NaNo project, so right now blogging is on the back burner. I have posts to last for a few weeks, but we'll see. Thanks for understanding! Mo had time to wash the blood off her hands and violently eat a Hong Kong snack—probably fishballs—before she had to be at the mechanical shop. Mechanics were dull and Mo really preferred the impossibilities of the nighttime sky. They said the stars disappeared above Hong Kong decades ago, but the city broke down and the stars shone again. Mo sometimes stood on one of the tallest buildings with teeth at the top—yes, I mean IFC in case you were wondering—and looked over the skyline and felt really rather powerful. And this paragraph was supposed to be poetic but it’s too early in the morning. Is this in any way clear she likes maths instead? Besides, mechanics paid less. But Mo needed a pretence that she wasn’t actually robbing corpses because tradition. Everyone pretended that was still a thing, and this line should be more quotable. ... I did tell you I rambled in these snippets. WIBAS is set in Hong Kong, or at least starts in Hong Kong and kind of becomes a roadtrip up north to China. It's all rather vague right now. It is, however, a futuristic wartime Hong Kong, so it's not completely realistic, but I do hope to convey that sense of a city almost too large to remember its people. Mo murdered two people that morning and her family would never know. And of course she didn’t feel guilty about that, and she didn’t feel guilty about brushing her mum off. Mo went off to boil Chinese medicine, which smelled absolutely horrible and might be kind of useless, if she went by the mechanic, but it worked if you believed in it kinda thing. Bro: I don’t like this. Mo: Too bad. I don’t like life much. Drink up! [feeds to bro] [cuddles] Mo hugged him mainly because she wished someone did the same for her, and her mum totally used to, but no. Bro: Could I go to school? Mo never went to school bc she was poor and stuff. Her mum tried to teach her bits of stuff when her father was around but then she had depression and stopped. Her grandmother had a proper education but that didn’t happen. Basically, to sum up this family, the dad was missing, the mum had depression, Mo had some sort of murder complex, and the bro had some kind of chronic illness. Yeah, that is actually my first draft. Revising is going to be such a pain in the neck, to put it politely. Me when revising, to put it less politely. The Midli islands had their fair share of pirates sailing the straits, but Barbos boasted brutality and absolutely no morals. Kim never managed to drag them into the courts after their attack on the capital at the end of the war. “I would go myself, but …” When he sighed, Mallister’s breath rattled like an old man’s. I don't even know why this snippet was so hard — I think it was just general out-of-inspiredness at the time, and the wording still feels awkward to me, but I am rather proud of Kim's lines. I'm rather proud of Kim, in general, as I feel obliged to mention she is the hanbok-wearing justice lady of Matryoshka. Did you link up with Snazzy Snippets? (Hint: click here to join us.) What books are in your hometown?